We have a new member of the feline family. Her name is Lappi which we have been told means paws in Russian. She is an 11 year old Hemingway Polydactyl black and white cat. She has been here since Monday night and is still scoping out the place. We have her on a trial run but I think she is going to stay. Our cats don't seem to mind her, she is not pleased with them and growls LOUDLY when they come near her. Here she is in the window. Once a week I will be posting some images that Kelsie has taken. 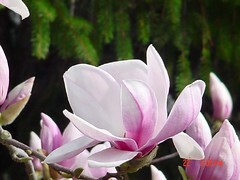 This first one is a close up of a either a pink dogwood or a magnolia tree. 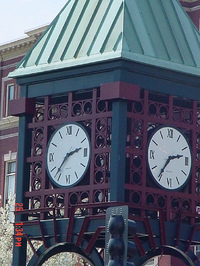 The second is the clock in the center of town and the third is a forsythea bush. Last week I took the kids for the annual check up. They are 16 now, getting close to the age when they will no longer be going to their pediatrician. 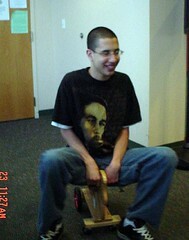 Although to look at my 5'8" guy, you would never know that he was only 2 years away from adulthood. We had a long appointment but both kids are healthy, a little sore from the 3 for him and 4 for her shots that happened but all set for at least another year. When we went Kelsie asked to bring the camera as she wanted to take these photos for her American Sign Language class. The nurse sure looked at her funny when she announced she was going to the bathroom and could she have the camera. Hope your family is healthy and happy as well. Last night was the big reveal at Julie's house for the sock swap that our little knitting group had. Boy was it fun. We had Carrie and Madame Purl on the phones, we opened our gifts according to birthday and we had some yummy burgers, rice, broccoli salad and homemade marshmellow smoores. I got great green socks from Madame Purl that fit perfectly. She also included some lovely roving in a beautiful gray and some chocolate and other goodies. Thank you Mme. everything was great! Check out the other ladies goodies here. Friends, Family and Food. These are all the ingrediants of a great Easter Sunday. This Easter we spent the day with Mary's family. Her parents, her sister Jeannie and her family (the wonderful hosts) her sister Betty and her husband and boys joined us for dessert. A great meal and fun and laughter was had by all. Check out more photos in my Easter set here Easter. Computers without which a great many of us would not know each other! Hurray for technology . baby booties - given as a Birth gift to a Beautiful Baby Boy! Great quick knit gift pop over to Julie's and grab the FREE instructions and make a pair or a dozen. Work up really fast and look great!